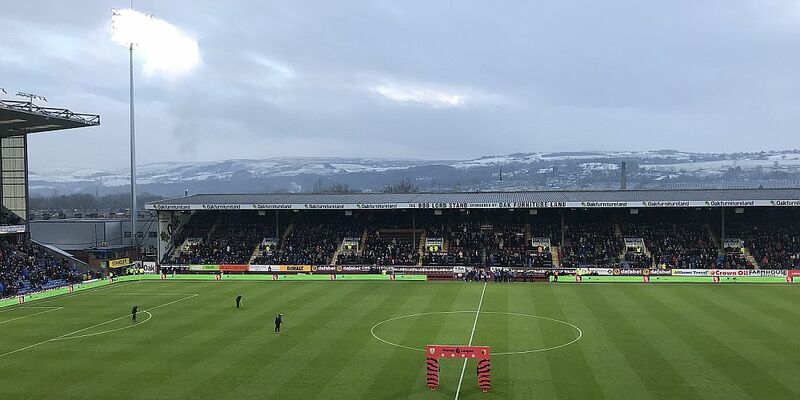 It’s been a week of weather forecasts and debates as to whether the game would be going ahead, but, barring a drastic change in the weather conditions, Burnley will kick off against Everton tomorrow afternoon at 12:30 p.m. in front of the Sky cameras. There hasn’t been a first team called off at the Turf in over eight years, and the last one was because of conditions outside the ground rather than anything inside, but there has been just cause for the concerns. Last Monday I sat in horrendously cold conditions at the under-23 game at Curzon Ashton and the weather has just got worse since. One thing I can say with some certainty is that the roads in the vicinity of Turf Moor, the main roads at least, were clear today, and the club have worked hard this week in ensuring the surrounds are as good as they can be although they have had to close the fanzone for the game. Burnley, of course, will equal an unwanted Premier League record if we fail to win tomorrow, that of extending our run of games without a win to twelve, which previously happened in the 2009/10 season. It was no surprise this week that the Burnley player put forward for the press conference was Aaron Lennon, our most recent signing. Lennon arrived from Everton in January, making his debut as a substitute in the 1-1 draw at Newcastle, and he was a very popular player with the blue side of Merseyside. Having started as a substitute, he’s started each of the last three games and had a particularly good time in the second half in the home draw against Manchester City. Tomorrow, against his former club, he’s likely to get his fourth start. The injuries are beginning to clear up. Last week we had Stephen Ward back in the starting eleven with both Dean Marney and Chris Wood on the bench. This week, manager Sean Dyche has said that Tom Heaton is edging close to challenging Nick Pope for that goalkeeper’s jersey whilst confirming that James Tarkowski is fit again and available for selection. Scott Arfield, however, remains out of the reckoning with a calf injury. In terms of the team, I think it centres very much on whether either or both of Tarkowski and Wood return. It would be very unfortunate for Ashley Barnes should he lose his place having scored again last week but I do think Dyche might be tempted to get Tarkowski back in, thus restoring the back four which played in every game until Matt Lowton was ruled out of the game at Bournemouth. If that’s the case, we could line up: Nick Pope, Matt Lowton, James Tarkowski, Ben Mee, Stephen Ward, Jόhann Berg Guðmundsson, Ashley Westwood, Jack Cork, Aaron Lennon, Jeff Hendrick, Ashley Barnes. Subs from: Anders Lindegaard, Phil Bardsley, Kevin Long, Charlie Taylor, Dean Marney, Georges-Kévin NKoudou, Nahki Wells, Sam Vokes, Chris Wood. Everton ended last season in seventh place in the Premier League. They were eight points behind sixth place Manchester United but some fifteen points ahead of Southampton who occupied eighth place. They were considered as the club most likely to make the top six a top seven and they spent a lot of money last summer. Sadly, for them, things didn’t work out quite as they expected. By the end of October they were in the relegation positions and had, by then, dispensed with the services of manager Ronald Koeman. Former Claret David Unsworth was given a month to try and claim the job permanently but things didn’t work for him and on the last day of November they appointed Sam Allardyce on a contract until the end of the 2019/20 season. Things have improved, undoubtedly, and they are now in the top half of the league just three points behind us. Like us, they have a player who has recently swapped one club for the other. In their case it is Michael Keane who left Burnley for Everton last summer and will be playing at Turf Moor against Burnley for the first time although he was on the bench for Manchester United in their 0-0 draw against us back in August 2014. Keane played in the game at Goodison earlier in the season, passing a late fitness test on a foot injury to take his place in the side, and he is expected to play tomorrow. Everton welcome defenders Seamus Coleman, Phil Jagielka and Leighton Baines tomorrow who missed out at Watford when they lined up: Jordan Pickford, Michael Keane, Ashley Williams, Cuco Martina, Idrissa Gueye, Jonjoe Kenny, Gylfi Sigurdsson, Tom Davies, Wayne Rooney, Theo Walcott, Oumar Niasse. Subs: Joel Robles, Mason Holgate, Luke Garbutt, Morgan Schneiderlin, Yannick Bolasie, Cenk Tosun, Dominic Calvert-Lewin. When Everton visited Burnley in October last season, we were still smarting from the previous home game when Arsenal had snatched victory in stoppage time with a goal that was offside, handball and anything else you can think of. This time it was us who scored the late winner, Scott Arfield scoring his first goal of the season in the 90th minute to secure a 2-1 victory and inflict only a second defeat of the season on Everton. Burnley made two enforced changes from the team beaten at Southampton with Arfield and Michael Kightly replacing the injured Steven Defour and George Boyd and that left us with just enough players with a bench that included two full backs and two central defenders. Embed from Getty ImagesEverton were the better side but it was the Clarets who went in front six minutes before half time when Kightly won the ball back. It moved through Ben Mee and Dean Marney to Jόhann Berg Guðmundsson. He found Arfield but his shot was parried by the goalkeeper into the path of Sam Vokes and he made no mistake. Everton were level in the second half. Romelu Lukaku broke but Yannick Bolasie took the ball form him to move forward and crash home a superb goal across Tom Heaton. We had to hang on but hang on we did and then, in that last minute of normal time, James Tarkowski, on as a substitute, won a header down to Michael Keane. Bolasie got a touch but it dropped for Guðmundsson who hammered his shot against the bar. It dropped for Arfield who finished brilliantly to send Turf Moor into raptures and Ronald Koeman crying there had been an injustice. We were 14th in the table. Burnley: Tom Heaton, Matt Lowton, Michael Keane, Ben Mee, Stephen Ward (Jon Flanagan 83), Jόhann Berg Guðmundsson, Jeff Hendrick, Dean Marney, Scott Arfield, Michael Kightly (James Tarkowski 74), Sam Vokes (Patrick Bamford 89). Subs not used: Paul Robinson, Tendayi Darikwa, Kevin Long, Aiden O’Neill. Everton: Maarten Stekelenburg, Seamus Coleman, Phil Jagielka (Enner Valencia 90+1), Ashley Williams, Bryan Oviedo, Idrissa Gueye (Tom Cleverley 83), Gareth Barry, Yannick Bolasie, Ross Barkley, Kevin Mirallas (Gerard Deulofeu 76), Romelu Lukaku. Subs not used: Joel Robles, Ramiro Funes Mori, Aaron Lennon, Mason Holgate.